Noyon Cathedral is a shabby little church, in an obscure little town in northern France that almost no one has heard of. Yet, it holds a special place in my heart; it may be small, but I know it more intimately than most other Medieval churches from the time. I have crawled through its guts. The town has about 13,000 inhabitants, making it roughly the size of Fergus Falls, Minnesota. Never heard of Fergus Falls? Well, that’s my point. 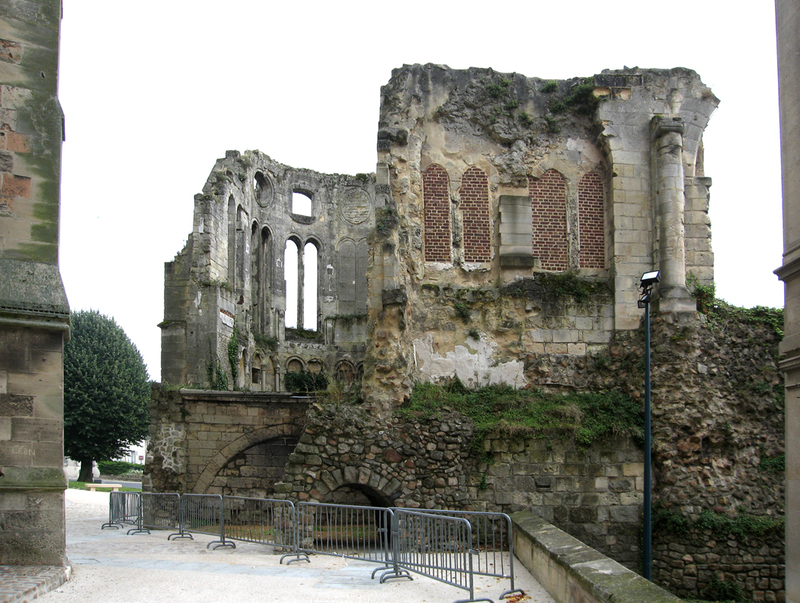 In the Middle Ages, it was the seat of a bishop, although the bishop left and moved to Beauvais in 1801 after the Concordat between Napoleon and Pope Pius VII. 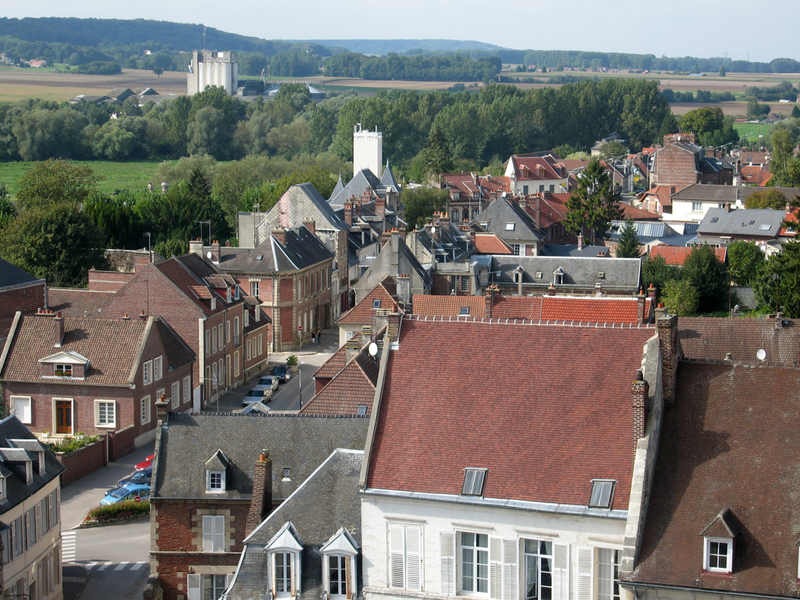 The town had had a bishop since AD 531, when the Bishop Medardus moved his seat to Noyon, choosing it over a rival city because he deemed the wine in Noyon superior. 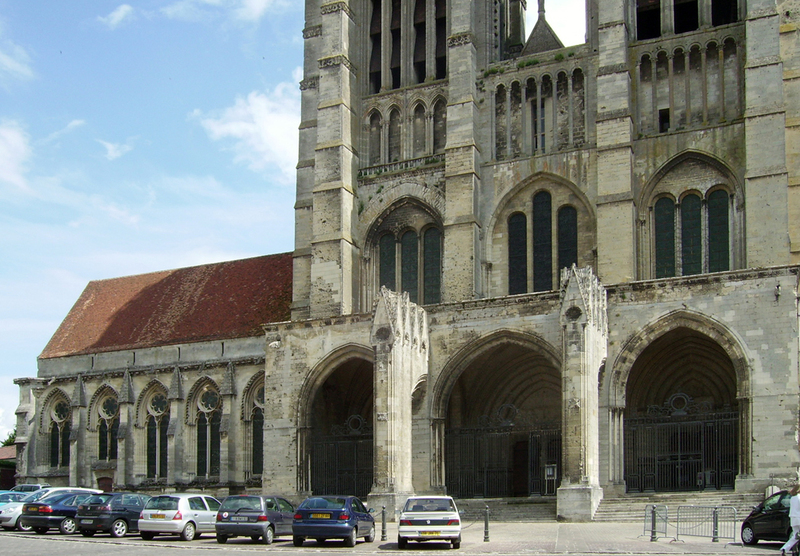 A cathedral had been built on the spot since then, being the place where in AD 768 Charlemagne had been crowned co-king of the Franks, and later, in AD 987, Hugh Capet was crowned the first Capetian monarch. It’s hard to imagine that now, with Noyon being such a backwater. 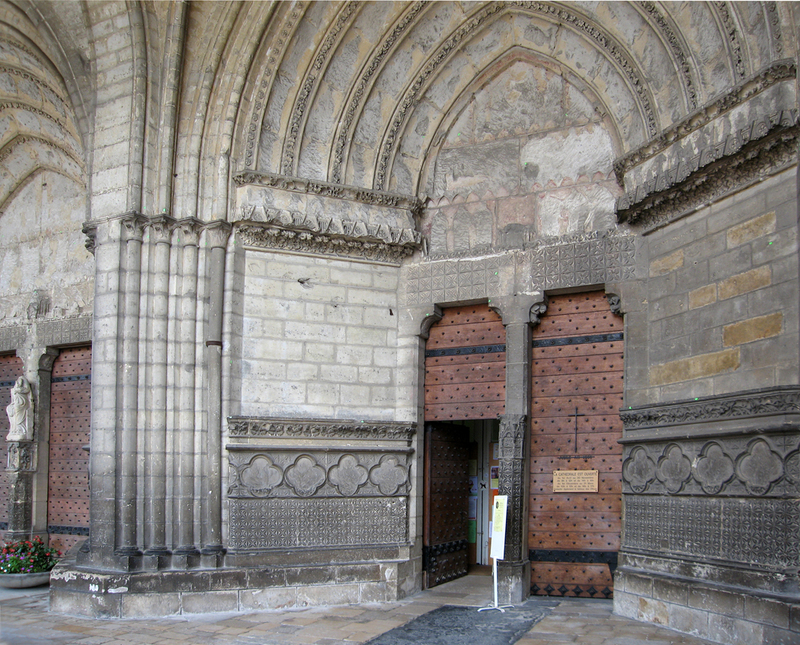 That early church — or churches (there were probably a sequence of them) — burned down in 1131 and the current building was begun in the new Gothic style soon after. Like most such churches, it was constructed and renovated, rebuilt and added to over the centuries. But the major part of the church is in the early style, including some Romanesque holdovers. Indeed, it looks rather plain compared with its compeers. 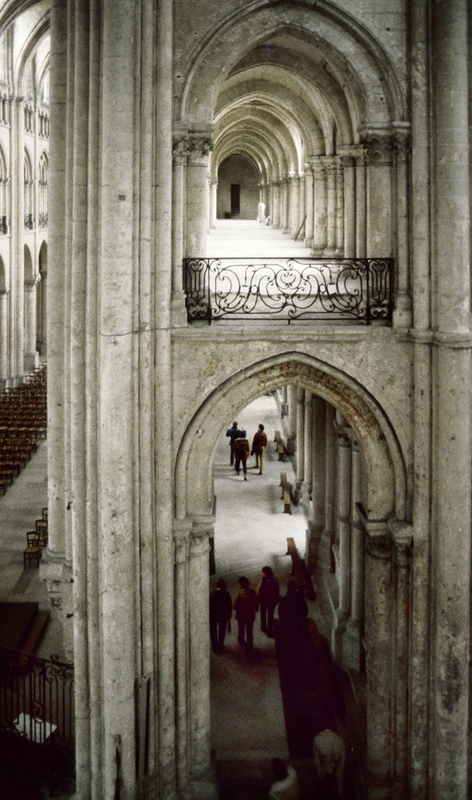 Noyon is notably smaller than Amien or Beauvais, and its cathedral is almost a miniature version of the familiar formula. Yet, it isn’t merely its style that explains its homeliness. The French Revolution had treated it miserably, knocking off pretty much all of its external sculpture. You can see the scars. You approach the cathedral through some narrow streets and we could see it before us, plain-spoken, with no statuary on its facade. Two nearly identical towers framed the central portals, of worn and weathered wood. 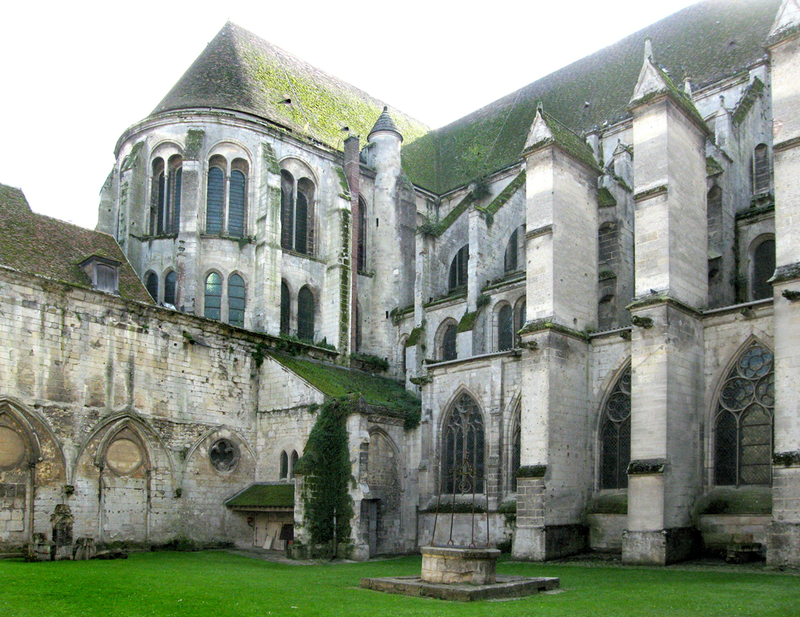 The West Facade also had two flying buttresses, something I had not seen before anywhere. They stuck out into the parvis. When we got closer, we could see that there had once been sculpture on the exterior of the building, but it had been chiseled off. 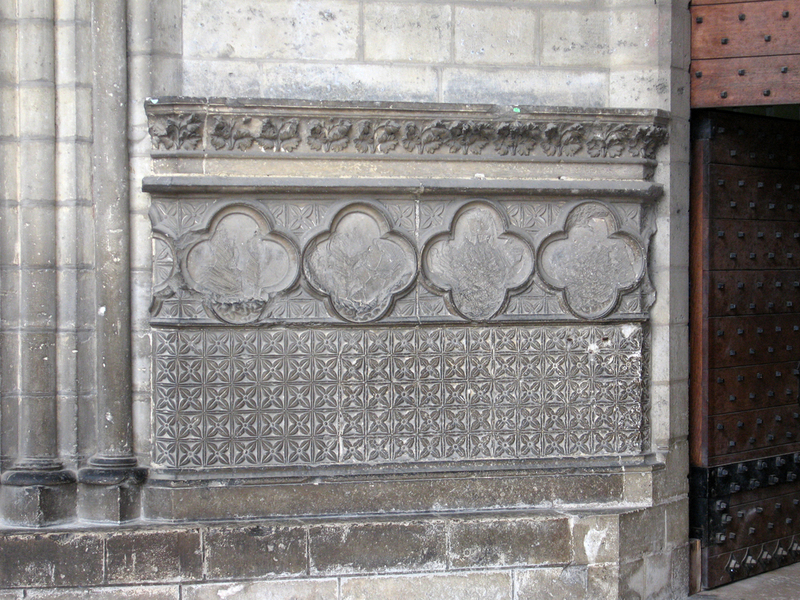 During the French Revolution, anticlerical feelings ran high and many of these old churches were defaced. 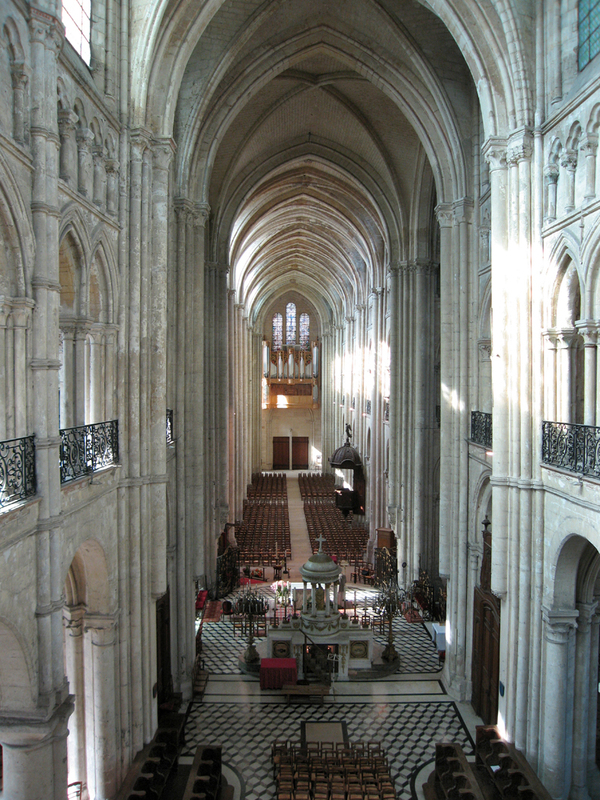 Some, like Notre Dame in Paris had been restored in the 19th century, but poor Noyon had been left bereft. 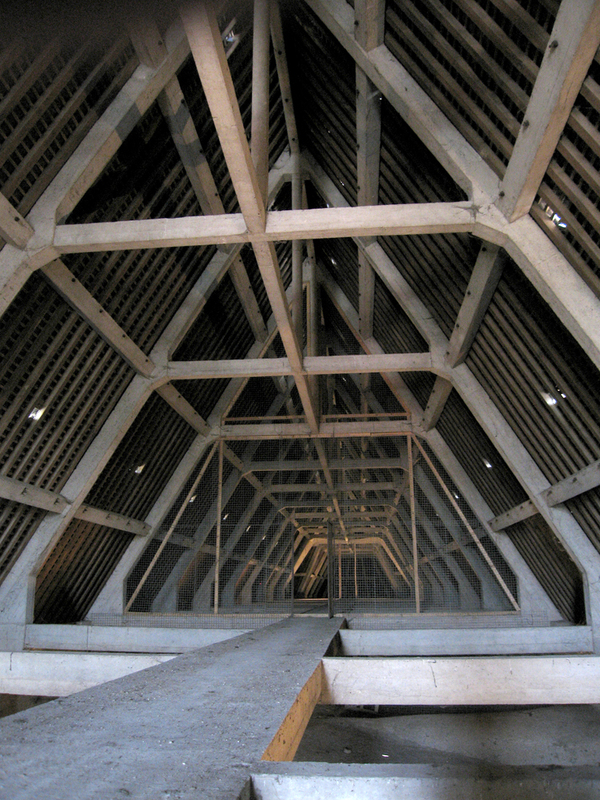 During the Revolution, churches had been deconsecrated and repurposed as “Temples of Reason,” or had, like Notre Dame in Paris, turned into warehouses for grain storage. 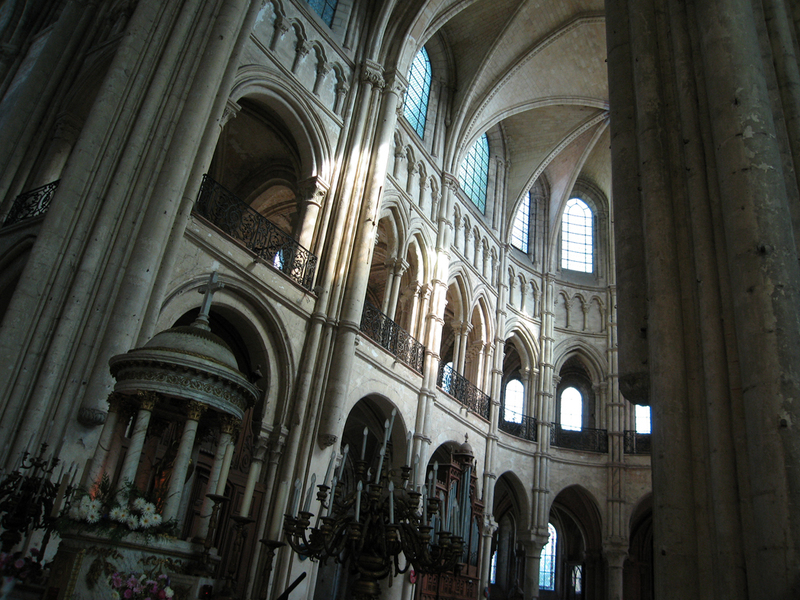 Noyon was, apparently, too insignificant for thorough restoration. You can walk around the building. 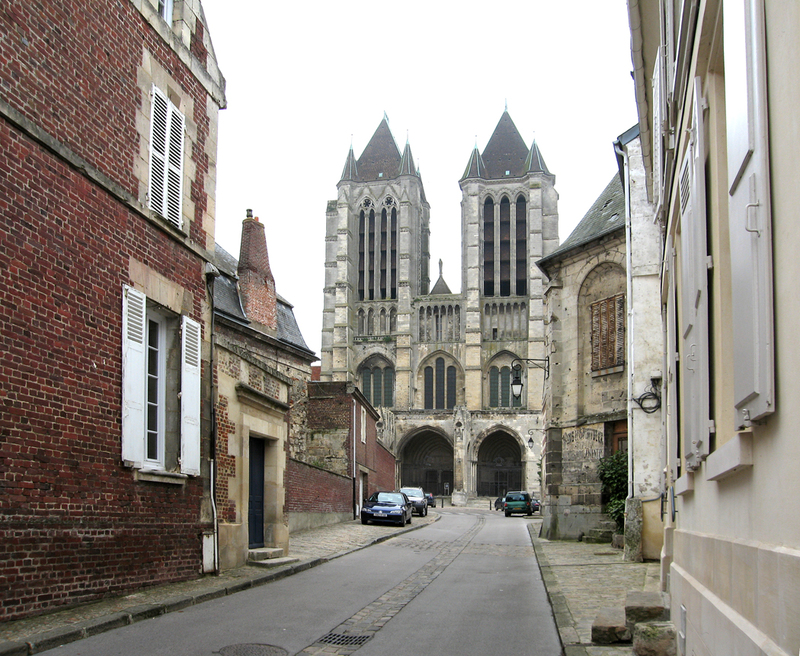 To the right you discover the ruins of the Chapelle Episcopale Saint Nicolas, an 11th century revenant, pass around the back and on the south side, the half-timber library. 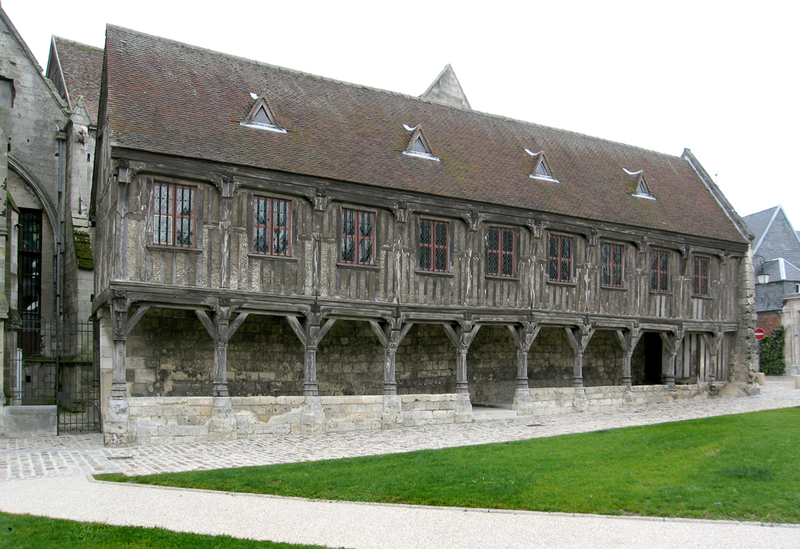 The larger stone edifice beyond that is the cloisters and refectory. Time to go through the portal. 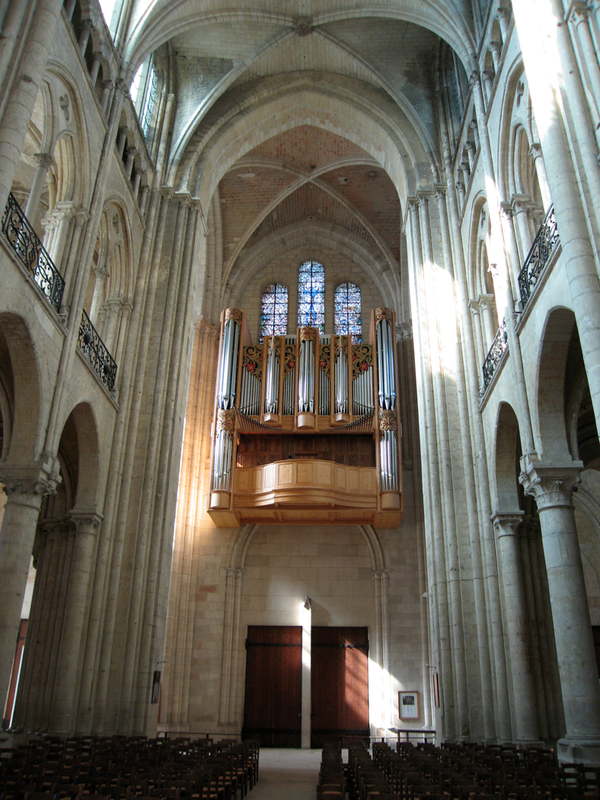 The interior is in better shape than the exterior and provides some of the awe and reverence you require from a Gothic church, and is truly their raison d’etre. It severs off a section of the universe, a bit of space, and lets you contemplate it divorced from the commotion and concerns of the day-to-day. You feel the immensity of that captured space and its stillness and it reminds you what is truly important, truly permanent. It is caged eternity and we watch it the way we see a panther at the zoo. I walked around inside, taking photos. And when I got to the ambulatory and got around to the far point of the apse, I stepped up to take a few pictures of the altar and nave, when an old, withered man walked up to me and spoke rapid French to me in a stutter. I was worried I had broken some taboo or regulation, and the man indicated I should follow him. I thought I was being taken to the principal, or at least the monsignor. 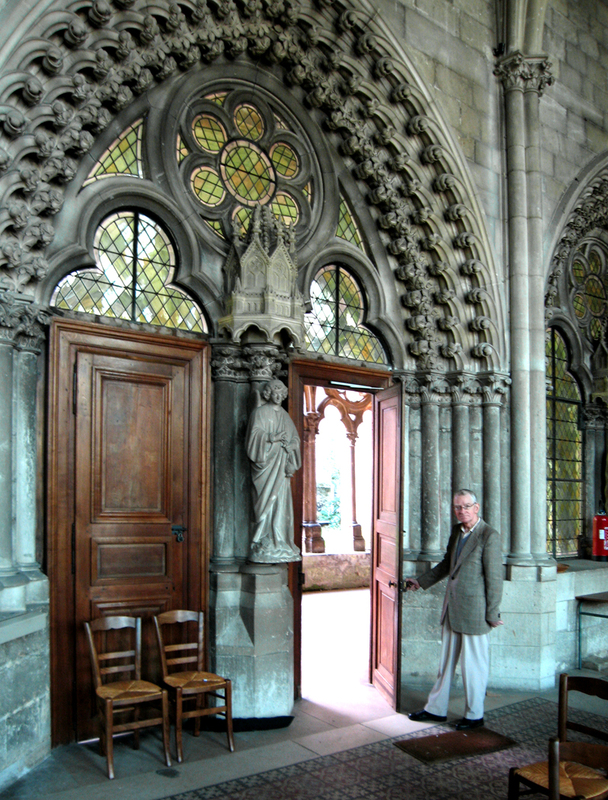 He dragged me along the length of the north aisle till he got to a side door, officiously pulled out a key and unlocked the door, opened it with a creak, and motioned for me to follow him into the cloister and garden that take up the north side of the church exterior. He was thin as a rail, with a day’s whiskers on his pointy chin, and gnarled hands twisted with arthritis. “Je ne parle Francais pas,” I repeated. And he said, “Oui, oui,” again. Then I said, “I get ma femme. 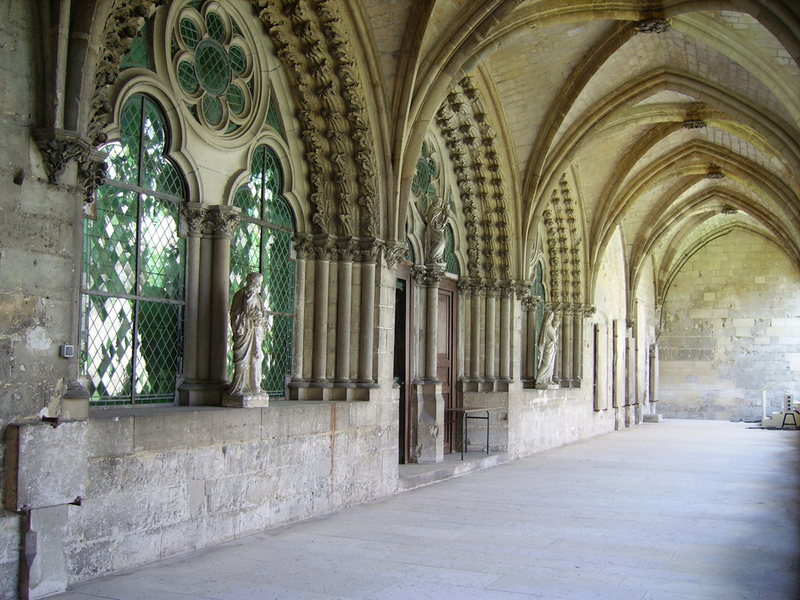 She parle Francais.” And he said “Oui, oui,” and I walked out of the refectory, down the cloister, into the nave, found Carole, waved at her wildly to get her attention, brought her back to the refectory, where the old man began speaking wildly to her. She answered like she understood what he was saying and they had a grand conversation. I’m not convinced either one had a clue what the other was saying or intended. “A frail old man with a terrible stuttering problem and crippled hands seemed to earnestly and excitedly be trying to communicate something to Richard,” Carole wrote in her diary entry for the trip. “And when I caught up with Richard, he took me to the cloister to the man and I told him I spoke only a little bit of French and he began speaking French as fast as he could. But, I was in luck. He was a terrible stutterer, so I got five or six reinforcements of every syllable. And after each of his phrases, I asked him in French, that is, my French, was I correct in thinking he had said so and so and so and so, and each time he replied “Oui,” and continued. “Then I would speak five and six sentences at a time. I was totally on a roll. I was understanding everything he said. He was assuring me he was understanding everything I was saying. I left the conversation walking tall, my chest swelling with pride. Hell. I was ready to light up a Gauloise. Let’s go do something French. Let’s go drink some vin ordinaire. “Then, Richard mentioned that this may have been a crazy man, and since the man was holding a basket, I asked Richard for some money and dropped coins in the basket. Now my confidence is going limp. I am realizing this is like the time I played the piano drunk. I could tell most of the notes I was hitting were wrong, but somehow, I felt it was my finest performance. He finally left us alone, and we enjoyed the refectory and the cloister and the garden. When we went back into the nave, Carole went off on her own and I walked back to finish what I had started at the apse end. When I noticed that there was a door open at the east end of the north transept, with a light on inside and a spiral stone staircase. I decided nothing ventured, nothing gained, and began climbing. 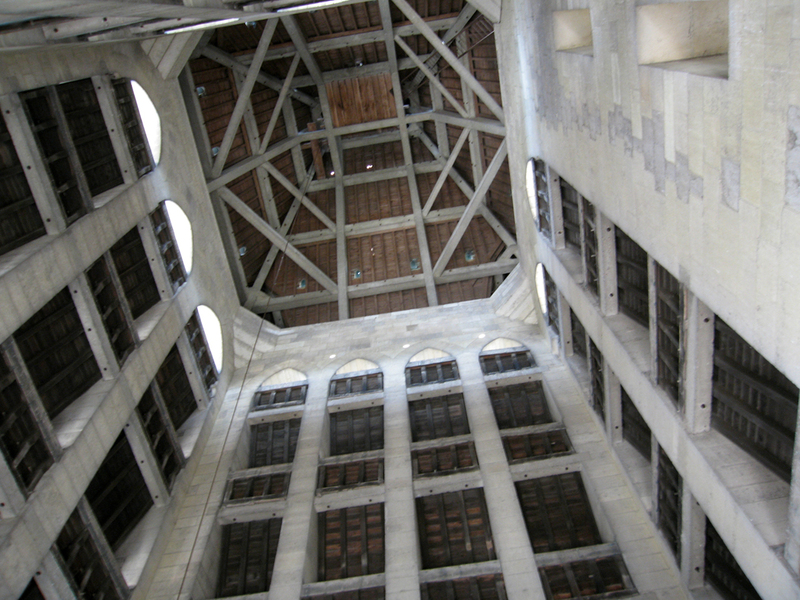 Where I got was the triforium around the apse, a second story ambulatory, covered in chunks of stone and mortar, with an uneven floor, loose electrical wiring and in places a floor that might as well be dirt. 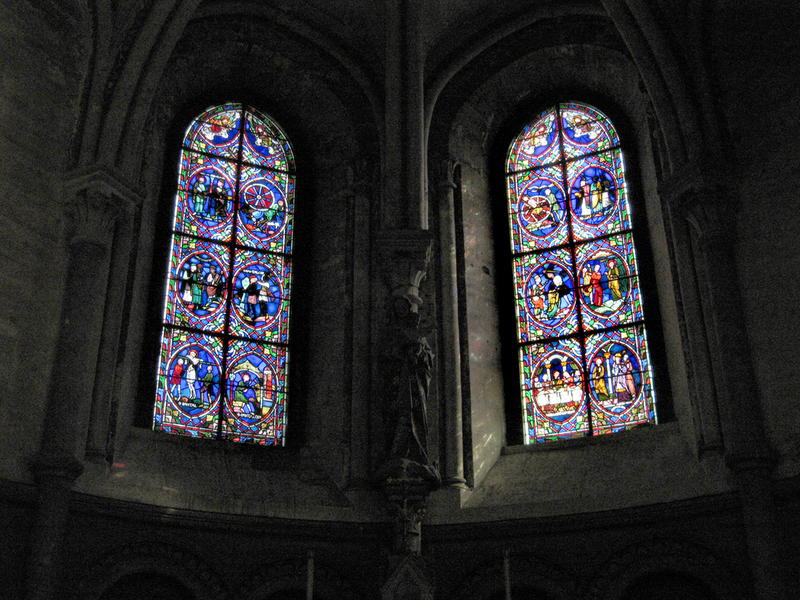 It looked as though in 800 years, it had never really been finished, but left roughed out, since it had no useful function other than to be looked at from the cathedral floor. I walked to the far end of the apse, took some pictures of the nave, full length, and was ready to walk around the triforium to the transept to have a look when four more people came up the stairs. Great, I thought. I’m OK. This must be part of the tour. But no, one of the four scolded me and told me something in French that made it clear I was not supposed to be there. I walked over to them, apologized, explained that the door was open, and I asked if they spoke English. The woman said “un peu.” and held up the thumb and index finger to indicate about three quarters of an inch. I told her that I didn’t understand what the man had said to me. She told me that I was not permitted up here, that she was bringing these two journalists up for a tour, and the third man was the sexton, who had the keys. “Merci, merci, plus merci,” I said, and tagged along. We went to the south tower at a door on the south aisle. The sexton pulled out his handful of keys and opened the door very slowly, to reduce the squeal of old hinges. We mounted the stone spiral staircase and began climbing, me bringing up the rear. Well, I’ve been up towers before, and they can be worse than lighthouses: We climbed and climbed, with no relief of window or landing, till we got to the first level of the tower. The bells were clanging; it was quite an impressive sound, not quite enough to deafen poor Quasimodo, but loud enough. The floor looked like a construction site; the kind with grout and cement spilled on the ground and left to dry to a powder. The floor was bumpy and uneven, and the walls were unfaced stone, left as raw as when it was cut from the quarry. If it doesn’t show, why spend the time and money to finish it. We went up another level — killing my poor knees, by the way, and practically bringing rigor mortis to my leg muscles. I huffed and puffed, but mostly, I sweated, Niagaras of sweat into my sports jacket. My shirt was a bathmat. The next level was much like the previous, but with slots to the outside, allowing a cool breeze to filter through. Yet one more level up, and we were at the top. Only the wooden roof was above us. Each of these levels was perhaps 30 feet high from floor to ceiling, and all left rough and unfinished. 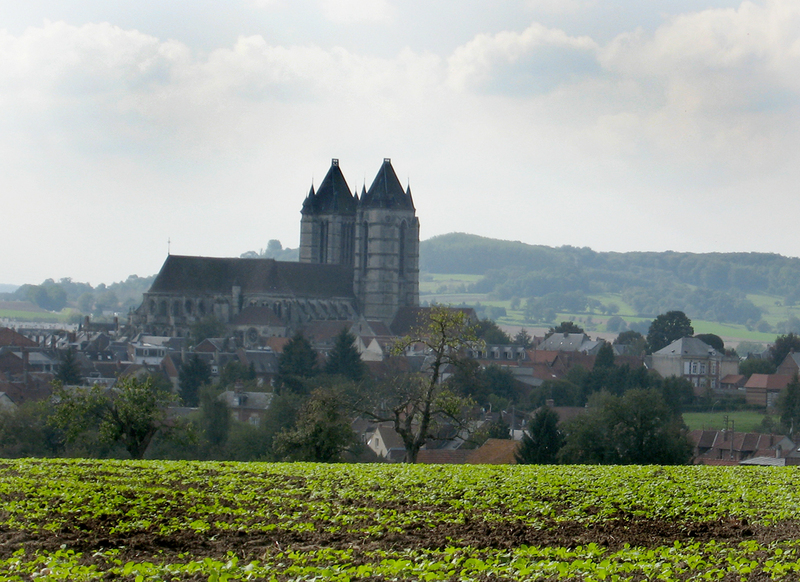 But we could look out at the city and see the paysage all around: Farm field and woods as far as the eye could see beyond the village. 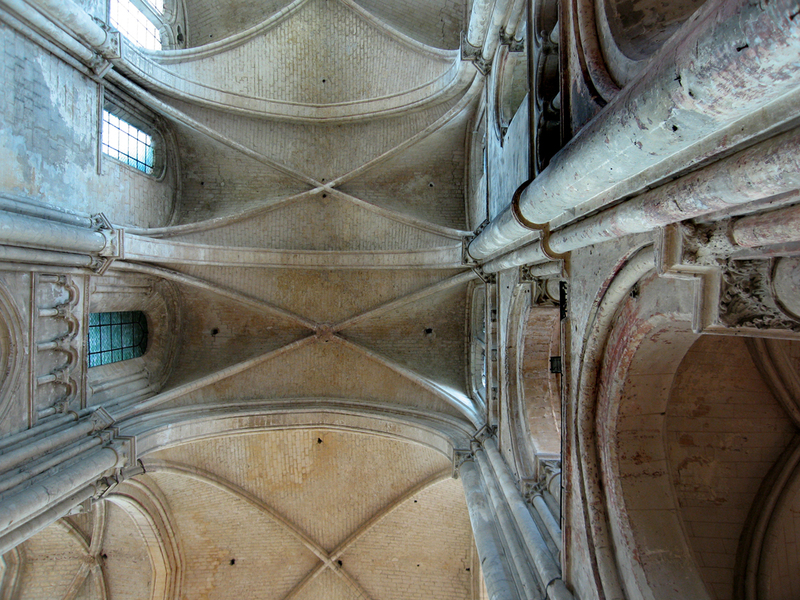 At one level, we ventured in towards the body of the church, and I could see the strut-work keeping the peaked roof up. 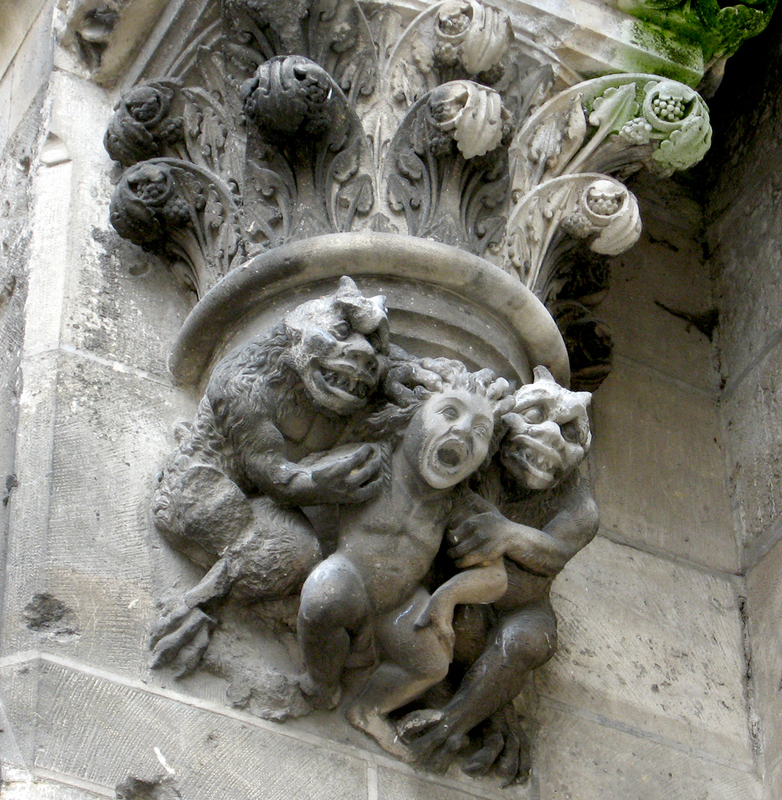 Crawling through the guts of the cathedral, I felt the thrill of Rotwang and Maria traipsing among the buttresses and gargoyles. 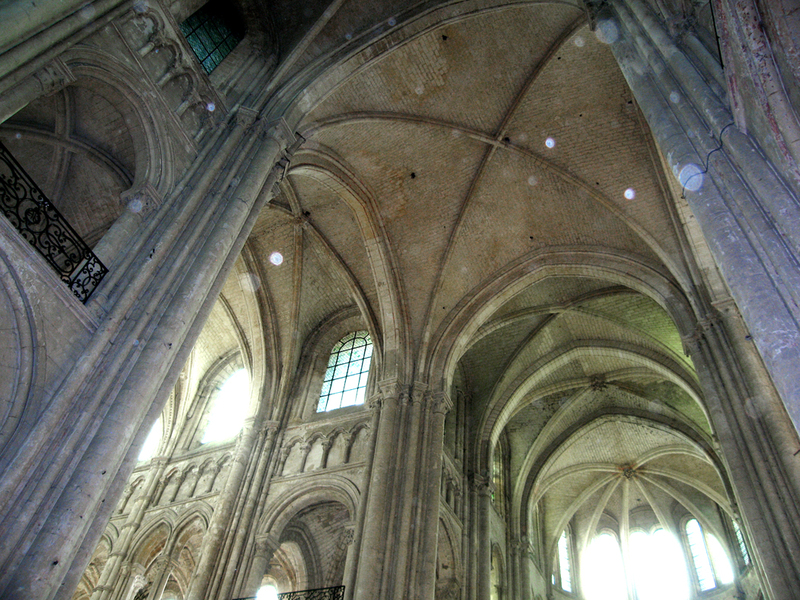 Noyon may be a forgotten relic of centuries past, but it is now the church I feel most intimate with. I have seen it backstage as well as front. After we walked back down, the church was being used for a funeral, and we all tried to be as quiet as possible. I thanked the woman and sexton for their hospitality, and left the church looking for Carole. She was outside, having sat through some of the funeral, but then having felt a bit intrusive, left the building to walk around outside. Anyway, it proved to be one of the best cathedral visits ever, and though I was drenched with sweat and beginning to stink that blue-collar stink, I was elated.